To purchase the Cornerstone Union Crane & Shovel scale model manual on printed paper click this PAYPAL button. 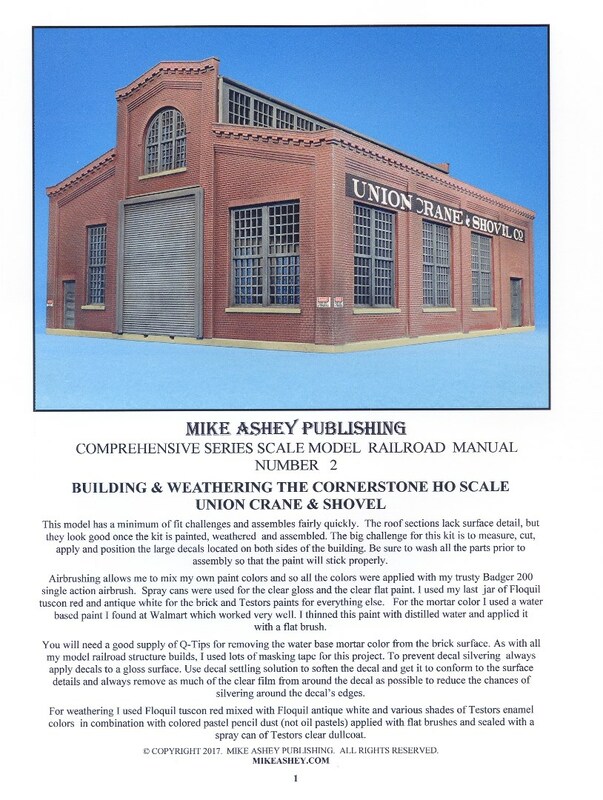 To purchase the Cornerstone Union Crane & Shovel scale model manual PDF click this PAYPAL button. This comprehensive series manual shows you how to fix the fit and gap issues during the assembly of the kit. The manual shows you how to strengthen the assembly and straighten out mildly warped parts. The finished brick work is painted and weathered and the manual demonstrates in step by step sequenced photos a simple way to paint the mortar between the bricks. Individual parts such as the window frames are painted and weathered and then glued into place. This manual shows you how to attach a large decal to an uneven surface by cutting the decal into smaller pieces.